Botkins sophomore guard Tyler Free dribbles with pressure from Anna’s Kamren Steward during a Shelby County Athletic League game on Friday in Anna. Anna junior guard Bart Bixler yells instructions during a Shelby County Athletic League game against Botkins on Friday in Anna. Anna senior Griffin Doseck dribbles during a Shelby County Athletic League game against Botkins on Friday in Anna. Doseck had eight points in the first half for the Rockets. 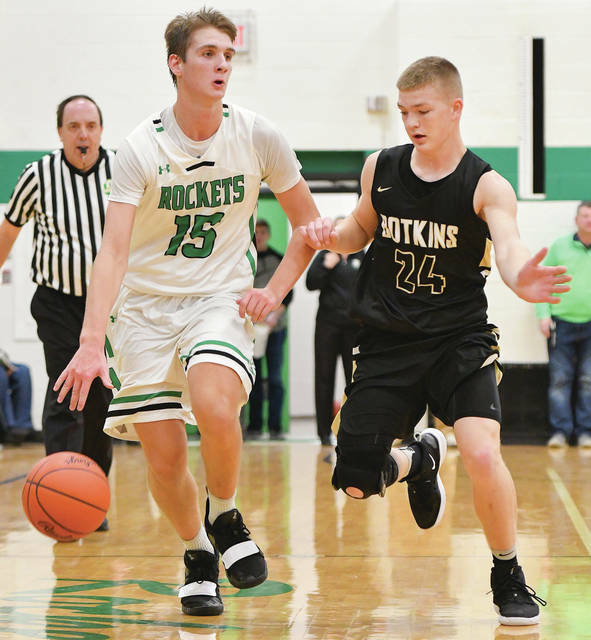 Anna senior Griffin Doseck dribbles with pressure from Botkins’ Conner Smock during a Shelby County Athletic League game on Friday in Anna. 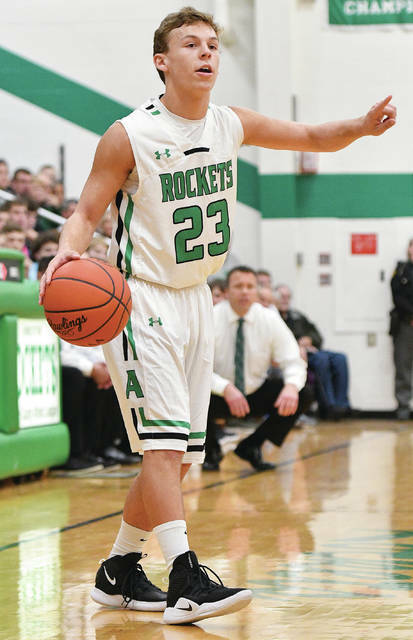 Doseck had eight points in the first half for the Rockets. View more photos of Anna’s win over Botkins here. ANNA — Botkins found out Friday night a lot of progress is needed to beat Anna at its own game. The Trojans have adopted a new up-tempo mentality this season, but Anna was too fast to slow down in a Shelby County Athletic League game on Friday. The Rockets ran away in the second half to win both teams’ season opener 72-46. 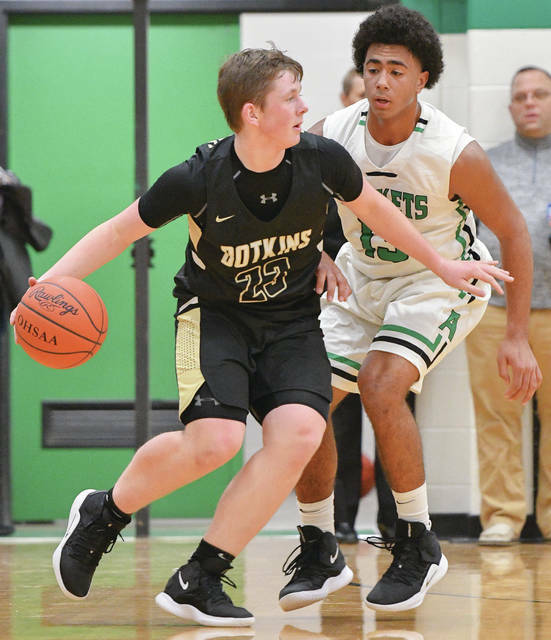 They led 31-19 at halftime of the Shelby County Athletic League game and scored the first eight points of the third quarter to break any hopes Botkins had of a comeback. “We weren’t really happy with our play overall in the first half,” Anna coach Nate Barhorst said. “We had some plays down the stretch where we didn’t execute. …There were some first-game jitters, too, for our guys that had the varsity uniform on for the first time. Trying to get them settled in was the other part of it. 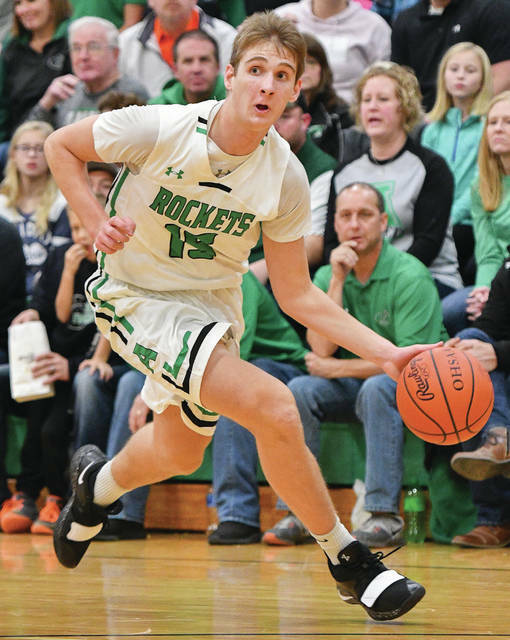 The Rockets tied with Russia and Fort Loramie for the SCAL title last year and didn’t show any reason to doubt they’re among the favorites this year. Anna’s man-to-man defense forced a bunch of turnovers and the team moved fluidly and quickly on offense. Bart Bixler led Anna with 22 points while Griffin Doseck scored 18. Doseck, a 6-foot-5 power forward, was able to get a lot of shots in the post. Bixler, a 5-11 guard, was able to penetrate and score as well. Barhorst was pleased with the way the team played in the paint. “That’s one thing we said coming into this season, that we need to have inside presence,” Barhorst said. “We’ve got a lot of kids that have put on some good weight and have put the pounds on by really hitting the weight room. Botkins showed flashes of its quick scoring ability, especially in the first quarter. But the Trojans were inconsistent and struggled to keep up on defense. It didn’t help that senior forward Spencer Heuker and sophomore point guard missed much of the first half in foul trouble. First-year coach Sean Powell said it was a good learning opportunity for the team to open the season. The Trojans will get a chance to respond on Saturday when they face Parkway in their home opener. Tyler Free led Botkins with 14 while Heuker added eight. Anna jumped out to an early 6-2 lead but Botkins fought back to tie it. Heuker hit a basket off the glass with 4:01 left in the first quarter to cap off a 6-2 run for the Trojans, which tied the score 8-8. Barhorst called a timeout, and Anna took over from there. Doseck and Bixler combined to hit 3-of-4 free throws to give Anna an 11-8 lead, then Steward made a layup after a steal with 2:19 left. Bixler made a basket in the paint on a drive, then Doseck followed with a drive and a bucket with 1:15 left and drew a foul. Doseck hit a foul shot to complete the three-point play and give Anna an 18-8 lead. Josh Madden hit a basket with 5:15 left in the second to bring Botkins within six points, then Free hit a free throw about 30 seconds later. Carter Elliott hit a 3-pointer and Huelskamp followed with two free throws with 4:01 left, which gave Anna a 23-13 lead. The gap stayed around 10 points for the rest of the half. Botkins returns to action on Saturday at home against Parkway. Anna plays again next Friday at home against Fairlawn. The Trojans and Rockets will face off in SCAL play again on Jan. 11 in Botkins. This entry was tagged Anna, Botkins, boys basketball, Griffin Doseck, high school, Nate Barhorst, Nathan Barhorst, Rockets, SCAL, Sean Powell, Shelby County Athletic League, Spencer Heuker, Trojans. Bookmark the permalink.